« Don’t Worry Planet, Mr. Adorable To The Rescue! 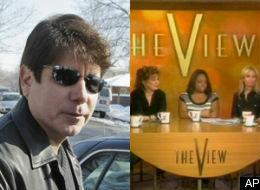 Screw The Senate, Blago’s Takin’ His Case To The People! Insane cartoon character Rod Blagojevich is hitting the media circuit in a desperate, last ditch effort to convince America he is not the foul-mouthed, puffy-haired demon governor he’s been portrayed as. In a move that forced even his defense lawyer Edward Genson to quit because it’s impossible to work with an unhinged moron, Gov. Blagojevich decided that instead of attending the Illinois Senate impeachment trial against him on Monday, it would be a much better idea to run around spouting his mouth on any network willing to have him (and that shrieking wife of his). So while Blagojevich charms the nation with appearances on “Good Morning America,” “The View,” and “Larry King Live,” the Illinois Senate will hold a vote to convict him on impeachment charges and boot him from office. But not because he is a classless scumbag facing federal charges for trying to shakedown everything from Barack Obama’s senate seat to newspaper editorial boards to a friggin’ children’s hospital. Not even close. It is all part of the vast conspiracy against Gov. Blagojevich for wanting to make taxes too low, doing too much to help the poor and sick, and just overall loving the citizens of Illinois too much. But if there’s one thing this tireless defender of freedom is sorry for it’s using such foul language. He would never use the “f” word if he knew it was being recorded. To think there could be children listening!